Tears had started rolling down her wrinkled cheeks. And then, she broke down sobbing inconsolably. I sat in silence, words had failed me. Language has this uncanny habit of leaving one in lurch when it is needed the most. Which language, after all, has words for grief that is betrayed by tears of a mother wailing for her daughter? The structures of language, as Harold Pinter once observed, have already moved far away from the structures of reality and has lost the capability of giving words to a thousand atrocities committed on hapless victims. I held her in a friendly, endearing embrace and let her sob. 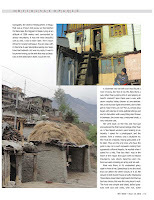 We were sitting in Duma village of Mugu district in mid-Western Nepal. The bright sunny afternoon was taken over by the clouds and chilly winds were nipping at my exposed face. 2200 meters up from the sea level, they had to. 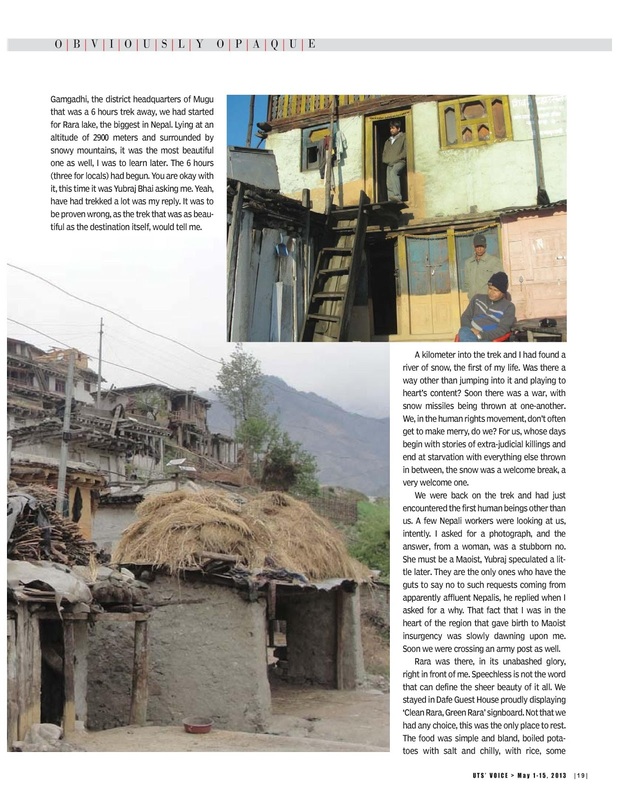 The dilapidated houses of the village were telling the tales of poverty and hardships that plagued the lives of their inhabitants. The only way out of this poverty was escaping, as she had told me minutes before, and that was not easy either. 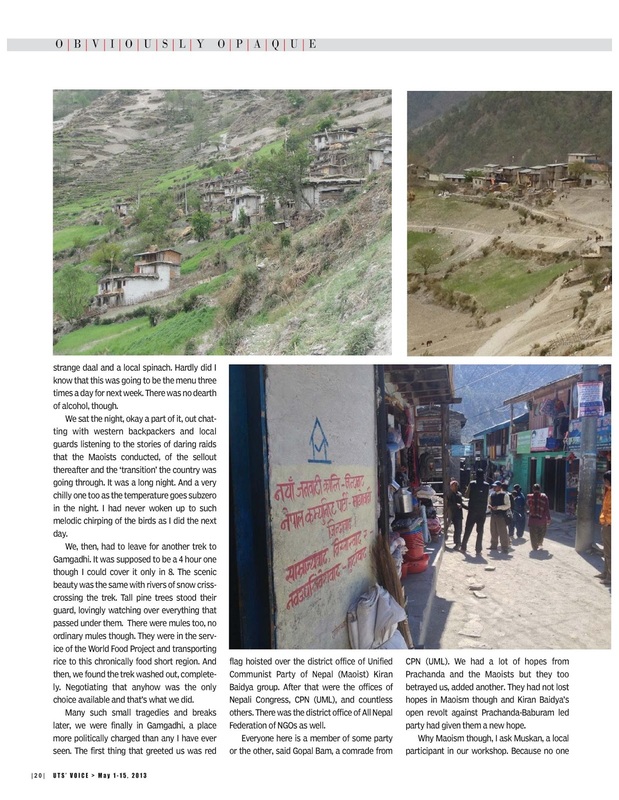 The village was 2 hours away from district headquarters at Gamgadhi and eight from Talcha, the nearest airport that gave villagers the only access to opportunities that were there in the world. 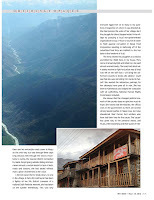 But then, flying being very expensive was not really an option for most of them and no motorable roads came to Mugu so the only way out was through three days long arduous trek through the snowy mountains to Jumla, the nearest district connected by roads. Forget going outside, falling sick here means almost a certain death for lack of both, roads and doctors, she had added without even a pinch of bitterness in her voice. I did not expect her to break down, no one in the village, in fact, did. Ladi Sunar has been a fighter all her life. District convener of a national Dalit-Feminist network, she has taken on the system relentlessly. This was why everyone egged her on to reply to my questions irrespective of whom it was directed at. She has become the voice of her village. Be it the struggle for dhara (tapped water) in her village by pursuing a local nongovernmental organization to buy a ‘mool’ or source of water to fight against corruption in Nepal Food Corporation resulting in siphoning off of the subsidized food they are entitled to, she has been in the forefront of it all. The Army labeled my daughter as a Maoist and killed her. Right here, in my house. They came in broad daylight and killed her, she said almost unemotionally. The tears had dried out. A steely resolve to fight for justice was all that was left on her stiff face. I will bring the uniformed cowards to books she added. I could see that she was not telling it to me but to herself. She needed the reiteration, perhaps, for her attempts have gone all in vain. 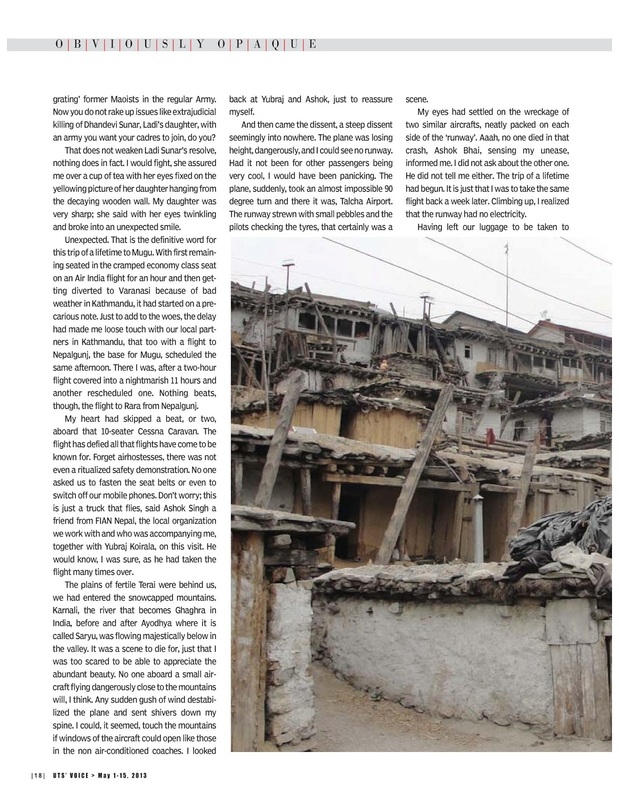 She has been to Kathmandu and lodged her complaint with all authorities, National Human Rights Commission included. She knows that the changed political scenario of the country does not give her much to hope. She knows that the Maoists, the official ones in the government as there are several strong Maoist parties in Nepal now, too have abandoned their former foot soldiers who have laid their lives for the cause. The ‘cause’ has given way to the personal wants, and feuds, of the leadership and their quest of ‘integrating’ former Maoists in the regular Army. Now you do not rake up issues like extrajudicial killing of Dhandevi Sunar, Ladi’s daughter, with an army you want your cadres to join, do you? That does not weaken Ladi Sunar’s resolve, nothing does in fact. I would fight, she assured me over a cup of tea with her eyes fixed on the yellowing picture of her daughter hanging from the decaying wooden wall. My daughter was very sharp; she said with her eyes twinkling and broke into an unexpected smile. Unexpected. That is the definitive word for this trip of a lifetime to Mugu. With first remaining seated in the cramped economy class seat on an Air India flight for an hour and then getting diverted to Varanasi because of bad weather in Kathmandu, it had started on a precarious note. Just to add to the woes, the delay had made me loose touch with our local partners in Kathmandu, that too with a flight to Nepalgunj, the base for Mugu, scheduled the same afternoon. There I was, after a two-hour flight covered into a nightmarish 11 hours and another rescheduled one. Nothing beats, though, the flight to Rara from Nepalgunj. My heart had skipped a beat, or two, aboard that 10-seater Cessna Caravan. The flight has defied all that flights have come to be known for. Forget airhostesses, there was not even a ritualized safety demonstration. No one asked us to fasten the seat belts or even to switch off our mobile phones. Don’t worry; this is just a truck that flies, said Ashok Singh a friend from FIAN Nepal, the local organization we work with and who was accompanying me, together with Yubraj Koirala, on this visit. He would know, I was sure, as he had taken the flight many times over. The plains of fertile Terai were behind us, we had entered the snowcapped mountains. Karnali, the river that becomes Ghaghra in India, before and after Ayodhya where it is called Saryu, was flowing majestically below in the valley. It was a scene to die for, just that I was too scared to be able to appreciate the abundant beauty. No one aboard a small aircraft flying dangerously close to the mountains will, I think. Any sudden gush of wind destabilized the plane and sent shivers down my spine. I could, it seemed, touch the mountains if windows of the aircraft could open like those in the non air-conditioned coaches. I looked back at Yubraj and Ashok, just to reassure myself. And then came the descent, a steep descent seemingly into nowhere. The plane was losing height, dangerously, and I could see no runway. Had it not been for other passengers being very cool, I would have been panicking. The plane, suddenly, took an almost impossible 90 degree turn and there it was, Talcha Airport. The runway strewn with small pebbles and the pilots checking the tyres, that certainly was a scene. My eyes had settled on the wreckage of two similar aircrafts, neatly packed on each side of the ‘runway’. Aaah, no one died in that crash, Ashok Bhai, sensing my unease, informed me. I did not ask about the other one. He did not tell me either. The trip of a lifetime had begun. It is just that I was to take the same flight back a week later. Climbing up, I realized that the runway had no electricity. Having left our luggage to be taken to Gamgadhi, the district headquarters of Mugu that was a 6 hours trek away, we had started for Rara lake, the biggest in Nepal. Lying at an altitude of 2900 meters and surrounded by snowy mountains, it was the most beautiful one as well, I was to learn later. The 6 hours (three for locals) had begun. You are okay with it, this time it was Yubraj Bhai asking me. Yeah, have had trekked a lot was my reply. It was to be proven wrong, as the trek that was as beautiful as the destination itself, would tell me. A kilometer into the trek and I had found a river of snow, the first of my life. Was there a way other than jumping into it and playing to heart’s content? Soon there was a war, with snow missiles being thrown at one-another. We, in the human rights movement, don’t often get to make merry, do we? For us, whose days begin with stories of extra-judicial killings and end at starvation with everything else thrown in between, the snow was a welcome break, a very welcome one. We were back on the trek and had just encountered the first human beings other than us. A few Nepali workers were looking at us, intently. I asked for a photograph, and the answer, from a woman, was a stubborn no. She must be a Maoist, Yubraj speculated a little later. They are the only ones who have the guts to say no to such requests coming from apparently affluent Nepalis, he replied when I asked for a why. 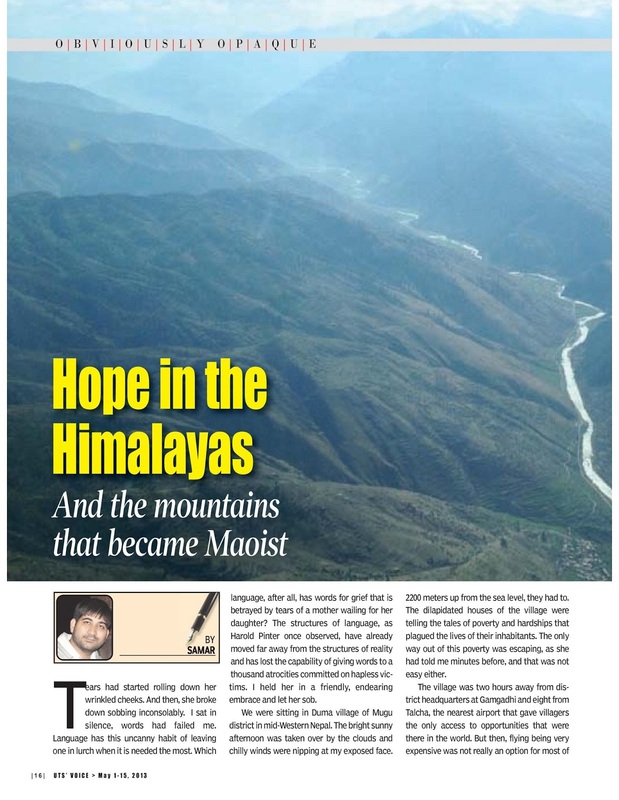 That fact that I was in the heart of the region that gave birth to Maoist insurgency was slowly dawning upon me. Soon we were crossing an army post as well. Rara was there, in its unabashed glory, right in front of me. Speechless is not the word that can define the sheer beauty of it all. We stayed in Dafe Guest House proudly displaying ‘clean Rara Green Rara’ signboard. Not that we had any choice, this was the only place to rest. The food was simple and bland, boiled potatoes with salt and chilli with rice, some strange daal and a local spinach. Hardly did I know that this was going to be the menu three times a day for next week. There was no dearth of alcohol, though. We sat the night, okay a part of it, out chatting with western backpackers and local guards listening to the stories of daring raids that the Maoists conducted, of the sellout thereafter and the ‘transition’ the country was going through. It was a long night. And a very chilly one too as the temperature goes sub zero in the night. I had never woken up to such melodic chirping of the birds as I did the next day. 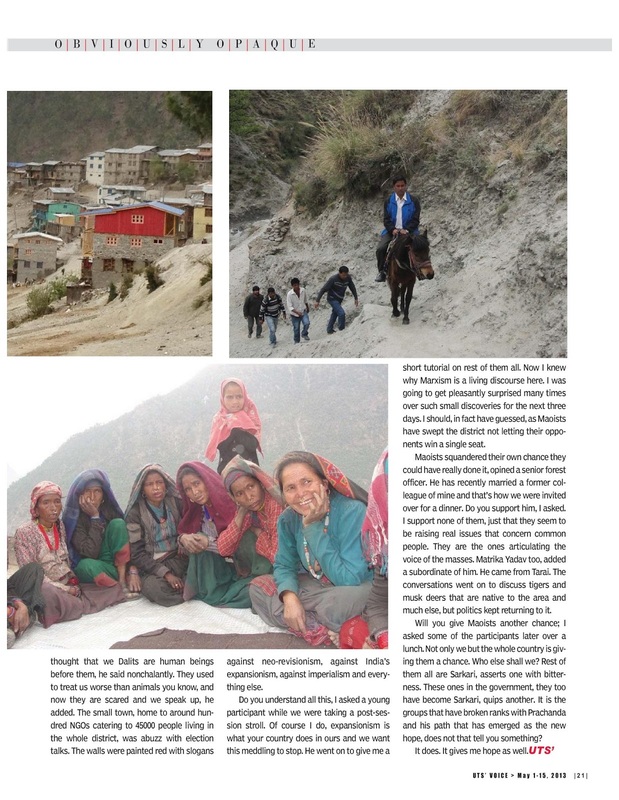 We, then, had to leave for another trek to Gamgadhi. It was supposed to be a 4 hour one though I could cover it only in 8. The scenic beauty was the same with rivers of snow crisscrossing the trek. Tall pine trees stood their guard, lovingly watching over everything that passed under them. There were mules too, no ordinary mules though. They were in the service of the World Food Project and transporting rice to this chronically food short region. And then, we found the trek washed out, completely. Negotiating that anyhow was the only choice available and that’s what we did. Many such small tragedies and breaks later, we were finally in Gamgadhi, a place more politically charged than any I have ever seen. 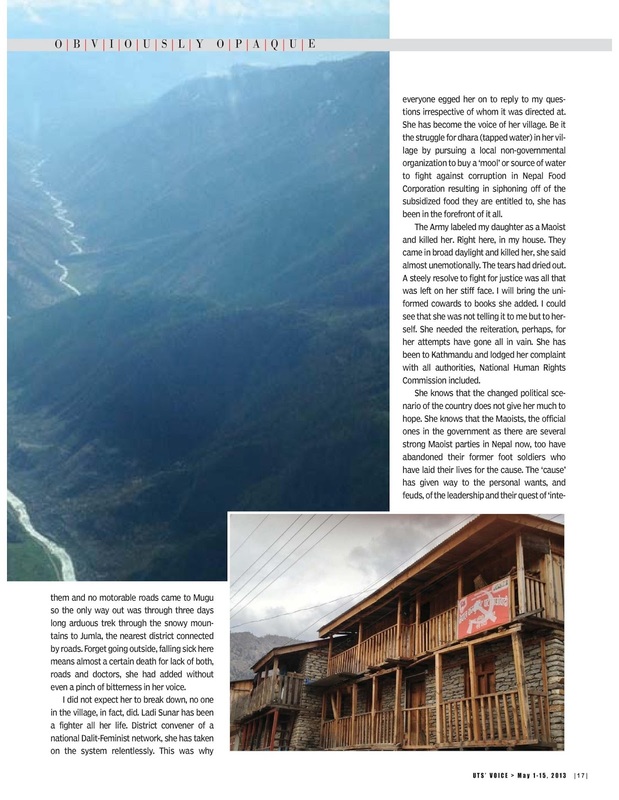 The first thing that greeted us was red flag hoisted over the district office of Unified Communist Party of Nepal (Maoist) Kiran Baidya group. 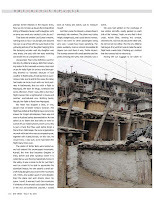 After that were the offices of Nepali Congress, CPN(UML), and countless others. There was the district office of All Nepal Federation of NGOs as well. Everyone here is a member of some party or the other, said Gopal Bam, a comrade from CPN (UML). 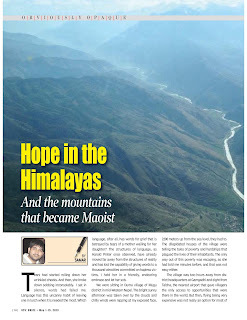 We had a lot of hopes from Prachanda and the Maoists but they too betrayed us, added another. They had not lost hopes in Maoism though and Kiran Baidya’s open revolt against Prachanda-Baburam led party had given them a new hope. Why Maoism though, I ask Muskan, a local participant in our workshop. Because no one thought that we Dalits are human beings before them, he said nonchalantly. They used to treat us worse than animals you know, and now they are scared and we speak up, he added. The small town, home to around hundred NGOs catering to 45000 people living in the whole district, was abuzz with election talks. The walls were painted red with slogans against neo-revisionism, against India’s expansionism, against imperialism and everything else. Do you understand all this, I asked a young participant while we were taking a post-session stroll. Of course I do, expansionism is what your country does in ours and we want this meddling to stop. He went on to give me a short tutorial on rest of them all. Now I knew why Marxism is a living discourse here. I was going to get pleasantly surprised many times over such small discoveries for the next three days. I should, in fact have guessed, as Maoists have swept the district not letting their opponents win a single seat. Maoists squandered their own chance they could have really done it, opined a senior forest officer. He has recently married a former colleague of mine and that’s how we were invited over for a dinner. Do you support him, I asked. I support none of them, just that they seem to be raising real issues that concern common people. They are the ones articulating the voice of the masses. Matrika Yadav too, added a subordinate of him. He came from Tarai. The conversations went on to discuss tigers and musk deers that are native to the area and much else, but politics kept returning to it. Will you give Maoists another chance; I asked some of the participants later over a lunch. Not only we but the whole country is giving them a chance. Who else shall we? Rest of them all are Sarkari, asserts one with bitterness. These ones in the government, they too have become Sarkari, quips another. It is the groups that have broken ranks with Prachanda and his path that has emerged as the new hope, does not that tell you something? . It does. It gives me hope as well.